The ”Hunt” or la ”Chasse” is a danish drama movie by Thomas Vinterberg starring Mads Mikkelsen. It alludes to the psychological conflicts between friends, family and the exclusion of one man. 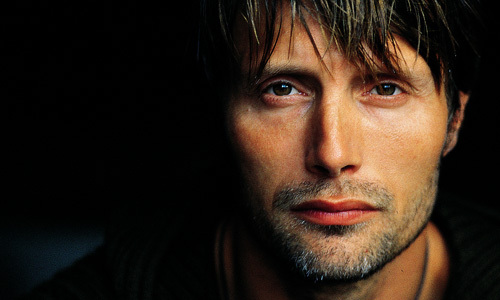 The leading role is played by Mads Mikkelsen. Yes, the one with the bleeding eye in James Bond Casino Royal, also known as Monsieur ”le Chiffre”. I did not know that this man could also play an affectional role! Sure! This is a compliment. In Casino Royale he definitely convinced me of his evilness! In this picture, he shows once again how excellent a performer he is. 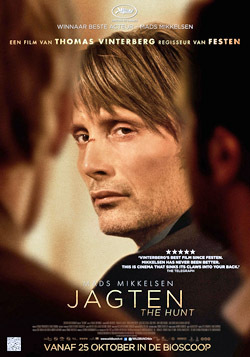 For his role in ”Jagten” Mikkelsen won the ”Prix d’interprétation masculine” au festival de Cannes 2012. Well, let’s move to this brand new drama. Thomas Vinterber, the director, well known for his past movie ”FESTEN” creates with ”Jagten” a new masterpiece. The movie describes a remarkably familiar theme. It is about a man, Lucas (Mads Mikkelsen), getting accused of child-abuse. Unfortunately, the accusation is based on a little girl’s phantasy. Little girls usually do not lie, do they? Living in a small town where everybody knows everybody and where everyone is, apparently, everyone’s friend, things are turning serious for Lucas. Suddenly nobody wants to be his friends anymore, not even his very best mate. In addition, is joining his extremely bad relationship with his wife and a fight to see his son. Partly, in my point of view, the story is getting to strong when it comes to the malicious persons. It is hard to imagine that a whole town turns against someone in just 2 days. In any case, it is exceptionally rare to watch a movie where one have to cry, laugh and is enraged at the same time. The movie provokes such an injustice, that the spectator will be furious even hours after the movie (at least this was the case for me). I highly recommend this movie, for anyone who is interested in strong psychological themes with a soupçon of humour. This entry was posted in Cult and tagged Casino Royal, Drama, entertainment, Festen, Festival de Cannes, Film, Jagten, la chasse, Mads Mikkelsen, Motion Picture, Movie, the hunt, Thomas Vinterberg. Bookmark the permalink.